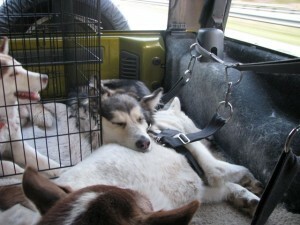 Siberian Huskies are, of course, a working breed. Qannik is no exception despite his fluffy appearance. This is a serious working dog and he is demonstrating his best known skill. 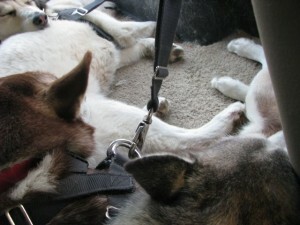 You take all of that fluffiness, turn it on its side, and Kiska and Kodiak demonstrate the “work” of Qannik – as a pillow. Yes, that would be Cheoah in her crate. Notice in this second picture that Natasha is using Kodiak as a pillow while Kodiak is using Qannik as a pillow. Trust me that NO ONE would try to lay their head on Queen Natasha the Evil. We love to see a good bit of teamwork. Nobody does that with me. Poo-face Salvador is very mean to me. I’m still trying to learn which of you pups is which though! Hey, Thundering Herd. More of Holly and KL’s furiends coming your way. We remember woo from Sibernet too. Thunder thinks the pillow idea is a great one but the boss lady Dakota will never allow that. We’ll back to visit again, be sure to stop by our blog too – we are newbies to the process. Hmmm… This is very interesting. I wish Steve would let me lay on him more. He’s very fluffy, but he does like me touching him when he’s sleeping. Mom sometimes wants to use me as a pillow, but none of the other dogs do. Khady hasn’t tried yet, but since she is my baby, I would probably let her.